The phrase has become known by millions, footage of Hurst’s third goal to make it 4-2 in the 1966 final not seeming right if it isn’t accompanied by Wolstenholme’s commentary. Wolsteholme had been saying: “And here comes Hurst, he’s got…”. Suddenly his attention was drawn from the forward bearing down on goal to fans running onto the playing surface. Although there was nothing particularly exceptional about pointing out that some people were on the pitch thinking the final whistle had sounded, the timing of the words as Hurst then scored and Wolstenholme uttered “it is now” meant they fitted perfectly. For Wolstenholme it was a line that would earn him lasting fame and he became almost as synonymous with England’s triumph as their 11 players in the final (poor old Hugh Johns was left to simply be the answer to the quiz question of ‘who commentated for ITV on the 1966 World Cup final?’). “He was one of us,” said England’s Martin Peters when talking about Wolstenholme. Wolstenholme followed it up with another famous set of words as Bobby Moore went to collect the Jules Rimet Trophy. “It is only 12 inches high… solid gold… and it means England are the world champions.” It was simple but telling and Wolstenholme later said he felt greater pride over this phrase than “they think it’s all over”. But the latter line would be the one he would forever be known for. If the BBC quiz show Pointless asked 100 people to name a Kenneth Wolstenholme commentary moment, it’s fair to assume the vast majority would give that as their answer. Wolstenholme could quite feasibly have not lived to enjoy his commentary fame, having put his life on the line serving as a bomber pilot in the Second World War. He thankfully emerged unscathed and with the Distinguished Flying Cross to his name. After being demobbed he established himself as the BBC’s top football commentator and covered the World Cups of 1954, 1958 and 1962. 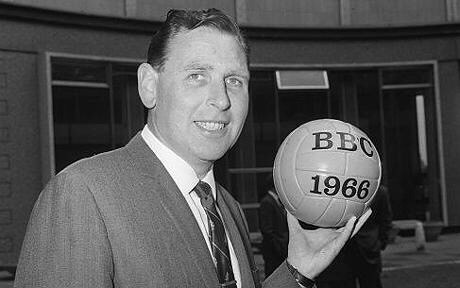 In August 1964 he both hosted and commentated on the first edition of Match of the Day but the following January he was hospitalised after a health scare. Mercifully he pulled through and, after a period of absence, returned to the commentary box. He was back to full form long before the 1966 World Cup began. He covered all England’s matches, including the controversial quarter-final win over Argentina when Jimmy Hill was alongside him as ‘summariser’. Paying tribute after Wolstenholme died, Hill went so far as to say: “It was like, for me, sitting there with God.” That perhaps gives some indication of just how highly regarded Wolstenhome was at his peak. 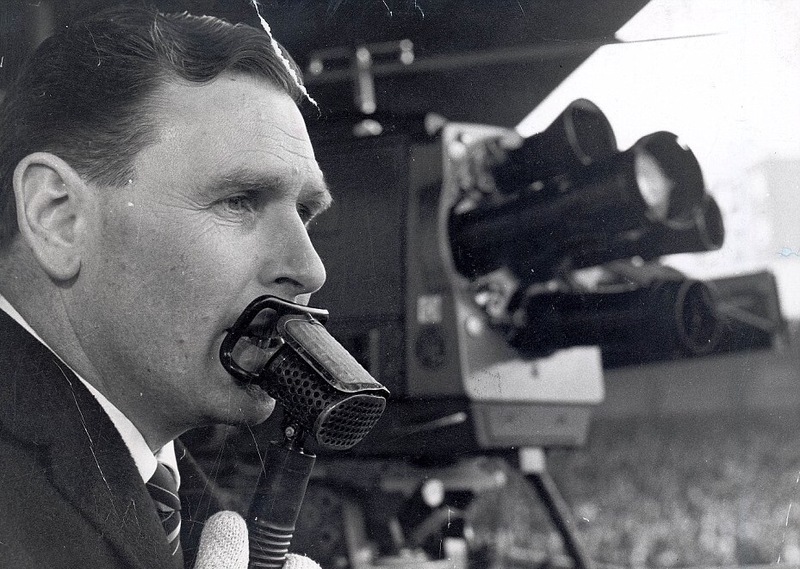 Despite this new-found acclamation from beyond his regular MOTD viewers after 1966, Wolstenholme’s days as the BBC’s top football man were soon under-threat. So much so that he never commentated on another England World Cup match. As black and white coverage gave way to colour television in the late 1960s, Wolstenholme’s face – or more appropriately his voice – no longer seemed to fit at the Beeb. David Coleman, already well-established as a sports broadcaster, was in growing demand as a football commentator and at the 1970 World Cup he was to describe England’s matches. Given that England were the defending champions and the big ratings winner back home, that says much about how the balance of power was tipping away from Wolstenholme just four years on from his greatest day. England’s collapse in the quarter-final against West Germany meant the anticipated row never erupted, but the die had been cast. Wolstenholme waxed lyrical about the “sheer delightful football” Brazil played in beating Italy in the final, but when it came to renegotiating his contract a year later he found the BBC wanted to remove the clause that he covered World Cup and FA Cup finals. It proved the last straw and Wolstenholme left the corporation just five years on from 1966 and shortly before his 51st birthday. His BBC days really were all over. In the present day, a commentator of Wolstenholme’s stature would almost certainly have been snapped up by a satellite broadcaster. But there was no such option in an era when viewers had just the choice of BBC or ITV. He was later to commentate on weekly highlights for the ITV’s regional North-East channel Tyne-Tees. There were worse gigs to have than covering matches in a football-mad region, but he was hardly being heard across the nation every week. In the rest of the country the match would be afforded brief highlights or nothing at all. Wolstenholme left Tyne-Tees in 1979, but when Channel 4 began covering Italian football in 1992 his voice returned to our screens on a regular basis as he rounded-up the latest Serie A action. In the 1990s Wolstenholme’s most famous line became the title for BBC comedy quiz show They Think It’s All Over. Wolstenholme complained about its use and it wasn’t the only time he would get protective over the phrase being applied. Its presence in a dog food advert particularly rankled. “I just can’t see what the phrase has to do with dog food,” he argued. “I am pretty proud of that phrase and it annoys me to see others pinching it and living off it.” It was surprisingly immodest stuff from Wolstenholme, although criticism could often be found coming from his lips in later years regarding the way he believed football commentary was going. 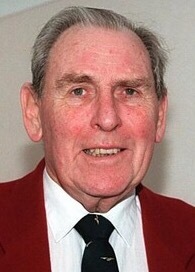 Wolstenholme’s commentary career was about far more than just one line, covering numerous memorable matches at both international and club level. But it was ultimately what he would be defined by. Wherever you looked after his death, a single piece of commentary on a July afternoon 36 years earlier was being talked about. And being synonymous with his own nation’s most glorious football moment wasn’t a bad way to be remembered.